This was done for a friend who owns this cool saree shop, The Silkworm Boutique. 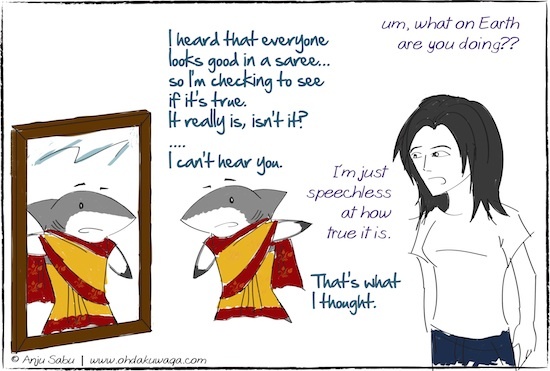 I promised to do a comic and then was stuck with wondering how on Earth I'd combine sharks and sarees. 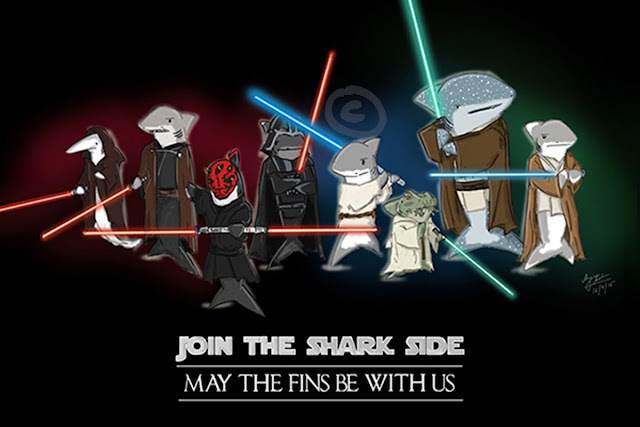 The answer is simple: just combine them. Since sarees have to be colourful, I had to colour it in. I picked a common combination - mustard & red. Obviously it's a good thing I didn't go into the saree designing business. After I coloured in the saree, everything else looked pale. ps - My intuos makes drawing so much easier except when it comes to the human. I really dislike drawing humans. pps - I usually spell it as "sari" but only when I searched for "saree" did I find some great reference images.